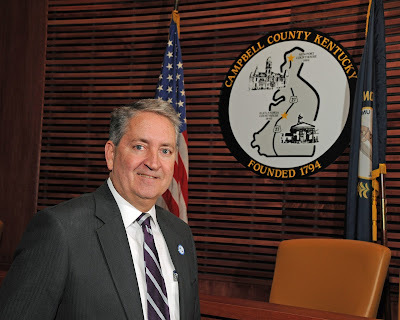 As a lifelong Campbell County resident who has been actively involved in our community, an elected official with nearly 16 years experience serving local governments, and a businessman with more than three decades of experience in the Northern Kentucky business community, I believe I have the qualifications to be re-elected to serve our residents for a second term as Campbell County Commissioner. Prior to my election to the Fiscal Court in 2014, I served six terms on the Fort Thomas City Council, where I served as chairman of the Public Safety and Parks and Recreation Committees and on the Finance and Public Works Committees. I have more than 34 years of experience in sales and business development and I currently work as director of business development for Furlong, a regional design-build construction company, as well as vice president of client relations for smartLINK, a Newport-based company that installs smart-city and smart-campus technology around the country. I am a lifelong resident of Campbell County. I attended St. Thomas Elementary School in Fort Thomas, St. Xavier High School, and Xavier University, where I received a BSBA in Marketing in 1984. My wife, Kim, and I raised our three sons — Tyler, Will, and John — in Ft. Thomas. I currently serve as a board member of the Northern Kentucky Area Development District, the eight-county planning and development organization that serves Northern Kentucky. I also serve on the Business Support Committee of the St. Elizabeth Healthcare Foundation Board. I am active in my parish, St. Catherine of Siena, where I serve as a Lector. I am proud of my Christian faith and the fact that the Northern Kentucky Right to Life has endorsed my candidacy in this race. I take my job as Campbell County Commissioner seriously. Similar to the approach I used while serving on Fort Thomas City Council, I thoroughly study the issues that come before the Campbell County Fiscal Court to obtain information and intelligence, and determine its effect on the county, before taking a vote. I try to make fact-based decisions designed to lead to long-term solutions, while emphasizing fiscal responsibility and protecting conservative values. I strive to do the right thing and make good decisions. I think my most important role as Commissioner is ensuring that our communities and families are safe. No community is immune to crime and we must continue to take steps to fight crime in every neighborhood and improve public safety for our residents, businesses, and first responders. The backbone of Campbell County’s public safety operations is its 911 communications system. Recently, I worked with other county officials to join with Boone and Kenton counties to purchase a new, state-of-the-art 911 digital radio network. This new network will replace the county’s outdated, unsafe analog system. The new network will allow our police, firefighters, and EMS personnel to get strong radio signals to and from dispatch operators and other first responders. This collaborative effort will save Campbell County taxpayers more than $1.2 million. I recognize that the heroin and opiate epidemic ravaging our region has touched the lives of many people in Campbell County, resulting in deaths, heartbreak, and increased criminal activity. Since becoming County Commissioner, I have worked hard to address this vexing issue, and I am proud to have been nominated for the Heroes Against Heroin Humanitarian Award because of these efforts. The county completed a $7.5-million addition to the county jail that dedicates beds to treat heroin and opiate addicts. This program has become a model for other counties in our region and state. We continue taking other concrete measures in the areas of prevention, enforcement and treatment to attack this difficult and disturbing issue. In conclusion, I believe that my past experience in business and government -- particularly my work as a Campbell County Commissioner over the past three and one-half years -- make me the best candidate on May 22, especially when you compare my experience and accomplishments with those of my opponent. I respectfully ask for your vote on May 22, 2018. Thank you.